1. Marinate the prawns in lemon juice and keep aside. 2. Mix the sesame see powder with 1/2 tsp oil, red chillies, garlic, red chilli powder, turmeric powder and salt. 3. Add the prawns and coat well. 4. Cover and keep aside for 45 minutes. 6. 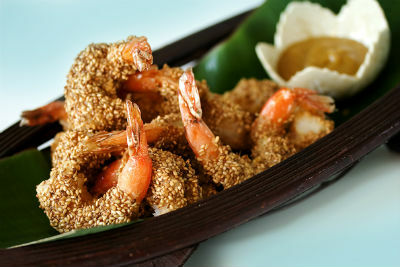 Roll the prawns in sesame seeds and deep-fry till crisp and golden brown. Feel free to comment or share your thoughts on this Sesame Prawn Tikka Recipe from Awesome Cuisine.